The two-spotted spider mite is the most common mite species that attacks vegetable and fruit crops in New England. Spider mites can occur in tomato, eggplant, potato, vine crops such as melons, cucumbers, and other crops. 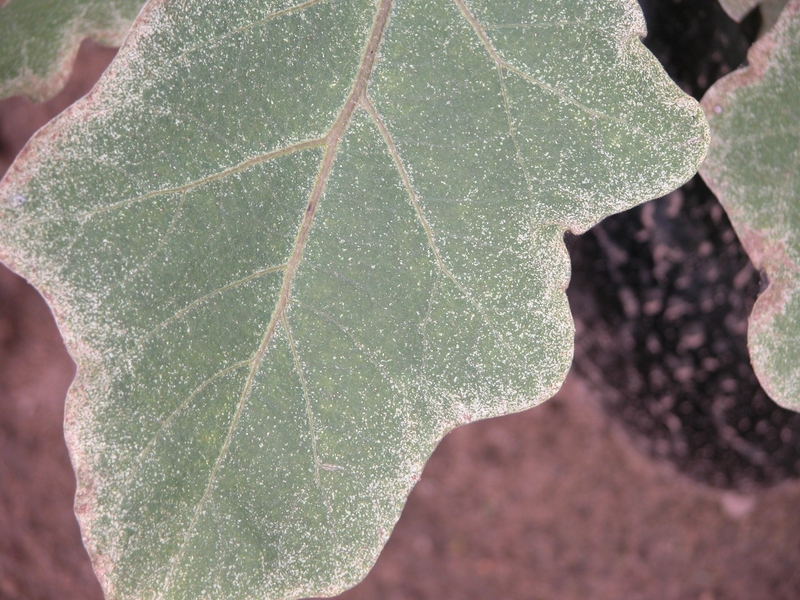 Two-spotted spider mites are one of the most important pests of eggplant. They have up to 20 generations per year and are favored by excess nitrogen and dry and dusty conditions. Outbreaks are often caused by the use of broad-spectrum insecticides which interfere with the numerous natural enemies that help to manage mite populations. As with most pests, catching the problem early will mean easier control. Eggs are laid singly, up to 100 per female, during her 3- to 4-week life span. Eggs hatch into larvae in as few as 3 days. Following a brief larval stage, several nymphal stages occur before adults appear. Egg to adult cycle can be completed in 7-14 days depending on temperature. Feeding injury often gives the top leaf surfaces a mottled or speckled, dull appearance. Leaves then turn yellow and drop. Large populations produce visible webbing that can completely cover the leaves. Watch for spider mites in greenhouses where vegetable transplants are growing. Also scout eggplants in the field. Checking for mites must be done by examining foliage. Adult mites are not found on sticky cards. Mites often develop as localized infestations on particular groups of plants such as beans or tomatoes. Sample plants by turning over leaves and with a hands-free magnifier (Optivisor) or hand lens, check for the presence of spider mites as well as symptoms or webbing. Adult females are approximately 1/50-inch long, slightly orange or pale green in color with two dark spots on their body. All mobile stages are able to pierce plant tissue with their mouth-parts and remove plant fluids. Saliva injected during feeding may also cause discoloration, necrosis or abnormalities on leaves, stems and fruits. 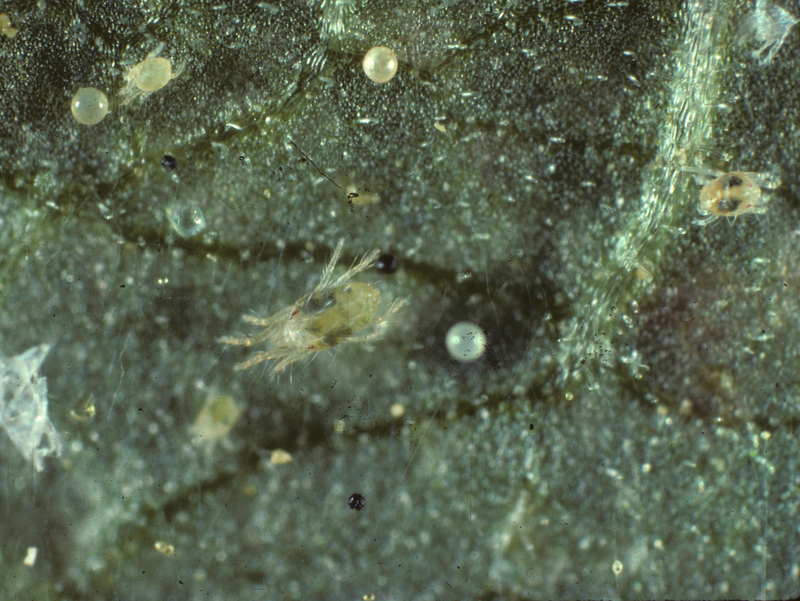 Most spider mites are found on the underside of leaves. A 10X hand lens is key for identifying the mite species, but injury, webbing, and the tiny adults can be seen with the naked eye. Avoid weedy fields and do not plant eggplant adjacent to legume forage crops. Avoid early season, broad-spectrum insecticide applications for other pests. Overhead irrigation or prolonged periods of rain can help reduce populations. Preventative releases of the predatory mite, Phytoseiulus persimilis, may suppress TSSM populations in greenhousese and vegetable fields, as they do in strawberry fields. Amblyseius fallicis is a predatory mite that is widely used in greenhouses. See New England Vegetable Guide on biological control in greenhouse bedding plants, Table 25. Scouting guidelines and biological control options for bedding plants. With most miticides (excluding bifenazate), make 2 applications, approximately 5-7 days apart, to help control immature mites that were in the egg stage and protected during the first application. Alternate between products after 2 applications to help prevent or delay resistance. For current information on production methods (including varieties, spacing, seeding, and fertility), weed, disease, and insect management, please visit the New England Vegetable Management Guide.